See what's new on WGT today, including a new high-level Odyssey Sabertooth putter and other game improvements. 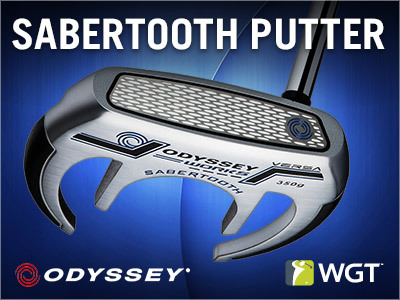 Odyssey Sabertooth Putter - This new, high-level version of the popular Sabertooth putter is great for top WGT players that want to improve their putting skills and lower their scores. Unlocks at (Level 98) in the Pro Shop. Putt Distance Shown on Putting Green - When a player makes a putt on the putting green, the distance of the made putt is now displayed. Avatar Facing Wrong Direction - In some game modes, some player avatars were displayed facing the wrong direction, which has now been fixed. Space Bar in Chat - Fixed an issue where some players experienced issues with their space bar not working in in-game chat. 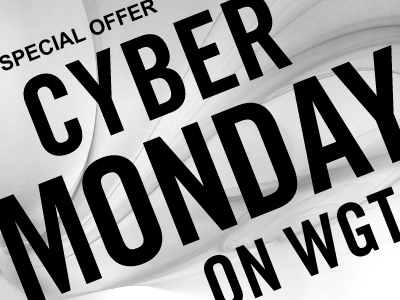 Today, get free virtual club rentals on WGT for Cyber Monday! This is your chance to try the latest virtual golf clubs from Callaway, Nike, Odyssey, TaylorMade and more – all free today! To rent clubs, just find the club you want to try in the WGT Pro Shop, click “RENT” or “TRY ME” button and it’s yours free for 24 hours. You can rent as many clubs as you want, Mon-Tues 11/28/16-11/29/16. *Note: This special offer is for Cyber Monday but since there will be a short downtime Monday evening, we’ve extended the free rentals until noon on Tues, 11/29. The very popular, very gold MAX virtual golf balls are back through Sun, 11/27! You don't even have to leave the house to take advantage of this special offer... 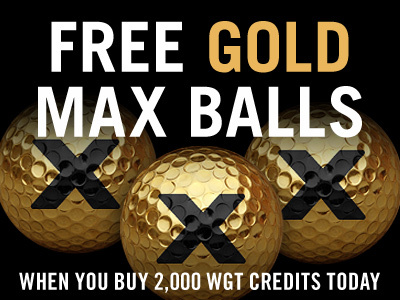 Starting today for Black Friday, get these special Gold MAX Slow Meter Vapor balls free when you buy 2,000 or more WGT Credits, through 11/27. These are some of the most popular virtual golf balls on WGT, in a special edition gold color with matching gold vapor trail to help you trace your shots through the air. Note, these limited edition virtual golf balls are no longer available in the WGT Pro Shop so this is your only chance to grab some! *Special one-time offer for players that buy 2,000 or more WGT Credits 11/25/16-11/27/16, get 3 free Gold MAX Slow Meter Vapor (Hack+) virtual golf balls on a single purchase. Get all Nike virtual clubs 5 levels earlier, right now on WGT! Nike is getting out of the golf equipment game, so we've reduced the level unlock on all virtual Nike clubs through November, so you can stock up before they're gone from WGT. 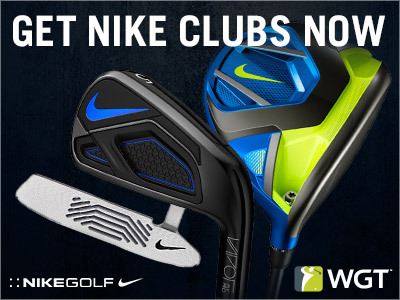 Don't miss this last chance to get Nike clubs before they go away at the end of November! Note, the level unlocks shown in the Pro Shop reflect the updated, lower levels. Play CC Event #35 going on NOW through Fri, 11/18. 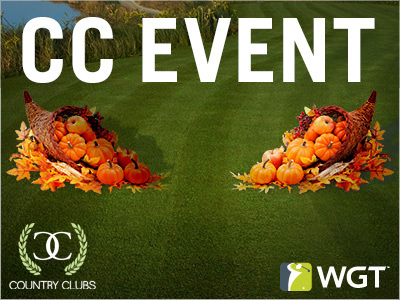 The holiday season is quickly approaching, so give your WGT Country Club members something to be thankful for! Compete in CC Event #35 for in-game rewards, including these seasonal Cornucopia tee markers and flags. CC Event #35 runs 11/17-11/18, with multiple 4-hour Clashes, so be sure to play as many games as you can for your club and keep your eyes on the leaderboard. Not in a WGT Country Club yet? Learn more and join one (or start your own!) here! 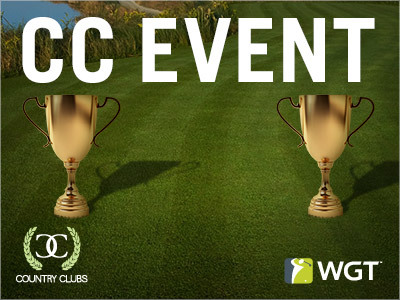 Play CC Event #34 today and tomorrow, to compete for these new trophy tees and flags for your country club. Join the Event, going on NOW through Fri, 11/4, to contribute to your WGT Country Club's XP, competing for top leaderboard spots and in-game rewards including these special tee markers and flags. 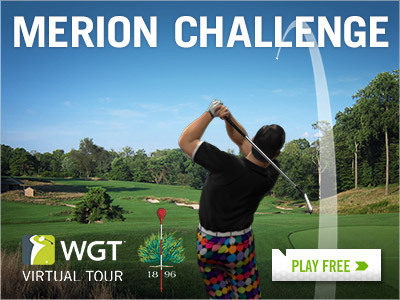 The WGT Virtual Tour continues in November with the Merion Challenge, the second tournament in the Oct-Dec Quarterly Season! Compete in this stroke play tournament and post your best score in the unlimited play first round (11/1-11/25), followed by a single-play final round (11/26-11/30). The top 70 combined scores in each Pro-Champion tier will split a total purse of 100,000 WGT Credits.